An Oslo Freedom Forum Side Event. INTERPOL is the world’s largest policing organisation, but it is being abused by countries around the world to persecute refugees, journalists & peaceful political demonstrators. Benny Wenda – Benny is a West Papuan tribal leader who leads an international campaign for the independence of West Papua from Indonesia. Due to his activities he was persecuted by the Indonesian government, subjected to torture and a politically motivated prosecution. Despite being a recognised refugee, Benny found himself with a public Red Notice against him. Michelle Betz – In 2012, Michelle was one of 43 NGO workers charged in Egypt of operating without a licence and receiving foreign funding, as part of a crackdown on independent civil society groups in the country. 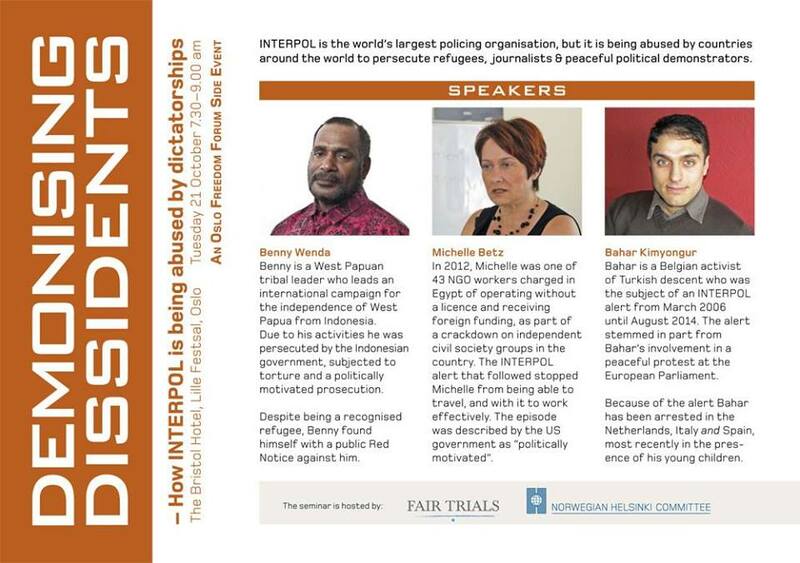 The INTERPOL alert that followed stopped Michelle from being able to travel, and with it to work effectively. The episode was described by the US government as «politically motivated». Bahar Kimyongur – Bahar is a Belgian activist of Turkish descent who was the subject of an INTERPOL alert from March 2006 until August 2014. The alert stemmed in part from Bahar’s involvement in a peaceful protest at the European Parliament. Because of the alert Bahar has been arrested in the Netherlands, Italy and Spain, most recently in the presence of his young children.